In case you are running on a system with slower hardware (like I am limping on Intel Celeron 1.86GHz with 2GB RAM) you might run into problems with Bibble while handling folders with large amounts of pictures in them (valid for both Linux and M$ Win). In some cases I even had the Preview generator hang right on the start and it never let go of the hanging preview generator even if I closed down Bibble and started from scratch again. It is useful for us slow folks to completely disable this feature. 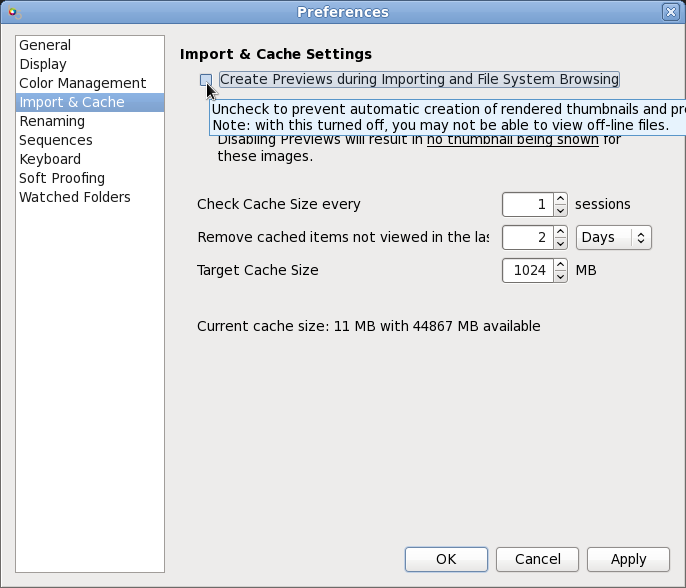 I have also changed the time cache is kept from 2 weeks to 2 days. Now it takes a moment longer to open every image, but in general it is well worth it as Bibble never crashed after this change again. In all honesty, one glitch did pop up on Linux. When using crop tool in Bibble, it is hard to move around the selected area as it is not following the mouse smoothly. There are minor glitches when moving the Curves sliders too. Not sure yet if that is because of something in the default Fedora configuration or if it's something with Linux version of Bibble. More on this after I figure it out.